(Nanowerk News) Television's Six Million Dollar Man foresaw a future when man and machine would become one. New research at Tel Aviv University is making this futuristic "vision" of bionics a reality. Prof. Yael Hanein of Tel Aviv University's School of Electrical Engineering has foundational research that may give sight to blind eyes, merging retinal nerves with electrodes to stimulate cell growth. Successful so far in animal models, this research may one day lay the groundwork for retinal implants in people. 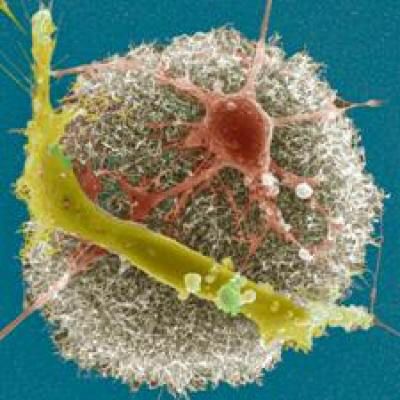 These are two rat neuronal cells bound to a rough carbon nanotube mat. But that's a way off, she says. Until then, her half-human, half-machine invention can be used by drug developers investigating new compounds or formulations to treat delicate nerve tissues in the brain. Prof. Hanein's research group published its work recently in the journal Nanotechnology. "We're working to interface man-made technology with neurons," says Prof. Hanein. "It can be helpful in in vitro and in in vivo applications, and provides an understanding of how neurons work so we can build better devices and drugs," she says. She's developed a spaghetti like mass of nano-sized (one-millionth of a millimetre) carbon tubes, and using an electric current has managed to coax living neurons from the brains of rats to grow on this man-made structure. The growth of living cells on the nano substrate is a very complicated process, she says, but they adhere well to the structure, fusing with the synthetic electrical and physical interface. Using the new technology developed in Prof. Hanein's laboratory, her graduate student Mark Shein has been observing how neurons communicate and work together. "We are attempting to answer very basic questions in science," Prof. Hanein explains. "Neurons migrate and assemble themselves, and using approaches we've developed, we are now able to 'listen' to the way the neurons fire and communicate with one another using electrical impulses. Listening to neurons 'talking' allows us to answer the most basic questions of how groups of nerves work together. If we can investigate functional neuronal networks in the lab, we can study what can't be seen or heard in the complete brain, where there are too many signals in one place." One application of Prof. Hanein's research is a new approach to aid people with retinal degeneration diseases. There are several retinal diseases which are incurable, such as retinitis pigmentosa, and some researchers are investigating a prosthetic device which could replace the damaged cells. "Neurons like to form good links with our special nanotechnology, and we're now investigating applications for retinal implants," says Prof. Hanein. "Our retinal implant attempts to replace activity in places of the damaged cells, and in the case of retinal diseases, the damaged photoreceptors." The team's major breakthrough is creating these man-made living "devices" on a flexible nano-material suited for the small area in the eye where new neuron connection growth would be needed. This is the first step in a long clinical process that may lead to improved vision — and perhaps, one day, a real-life six million dollar man.